We rarely get “do-overs” in life, and our finances are no exception. So, I cannot change a thing I did in my 20s from a financial standpoint, darn it. However, I CAN write about my own stupid mistakes and hope that it helps some of you (or someone you know) from making the same ones! Especially if you have the dream of retiring early, having your ducks in a row in your 20s is going to be important, if not critical. I know, it seems like everyone takes out student loans for college. It almost seems impossible to do it without borrowing since college has gotten so crazy expensive, right? And it seems like everyone has a credit card. Probably lots of people you know have car loans, too. Isn’t is normal to have debt in your 20s? I know it certainly seemed like it for me! I knew people with all of those types of debts, which sort of took away the stigma. After all, if my friends, co-workers, boss, and neighbors all had debt, what was so wrong about that? Everything! Throughout my time in undergraduate and graduate school, I had all of those types of debts. I mostly paid the credit card bills off every month, and the car loan didn’t last very long, but the one that really bit me was the student loan debt. As I’ve written about before, I made some pretty stupid mistakes in grad school, but by far the biggest was living too high on student loans. I’m ashamed to say that part of the reason that I felt so comfortable spending so much money when I was living off loans is because most of my friends in grad school were living similarly- so I was basically just doing what a lot of others were doing. That’s ok, right? Of course, the answer is no, it’s not alright! After all, none of those people are here today almost a decade later helping me pay off the student loans that are still hanging over my head! By far, the BEST piece of financial advice I’d give to my 20-something self is to be EXTREMELY careful when taking on debt. Every single penny of debt has to be paid back, and more, since loan companies aren’t just in this ‘cuz they’re nice. No, in most cases they just want to make money off you, and they do it through charging you interest on the money you borrow from them. Taking on too much debt- of any kind- can have a tremendous impact on your finances for years to come, and may prevent you from being able to retire early or at all. Even though many people would consider something like student loan debt to be “good” debt, if I could do it all over again I’d take extreme measures to try to avoid it. Luckily these days there are cool websites like Scholarship Owl that help you apply to lots of scholarships at once, making it much easier to find and apply for scholarships than it used to be. 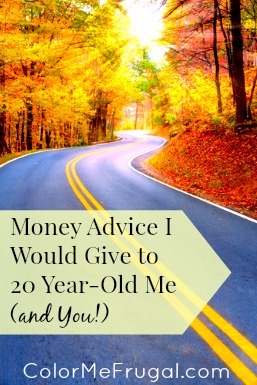 The other piece of advice I’d give my 20-something self would be to start saving right away! Both for retirement and in general. As in, from the very first day at the very first job. It’s so much easier to continue saving if you get in the habit right away, as soon as you start making money. Even having a few hundred dollars in an emergency fund can help prevent you from having to go into debt when an emergency strikes. I recall vividly an expensive fuel pump problem that my car had in college, both because it broke down while I was driving on the interstate (scary!) and because it cost me $700 to fix it. At the time, that $700 was a fortune to me. I didn’t have it. At all. Anywhere. I had to put the $700 repair bill on my credit card, and then I promptly began freaking out about how I was going to pay that $700 off. I ended up cashing out some stocks that my mother had invested in for me in order to cover that bill. To this day I wonder how much those stocks would be worth now if I hadn’t cashed them out. Which leads me to the subject of investing for retirement in your 20s. You don’t have to go great guns and max it out right away, the important thing is to just START. With something, anything. It’s ok to start with 1% of your take-home pay if you have to (as long as you continually increase it over time- most experts recommend contributing, at a minimum, 12-15% of your pay). But the most important thing is to just START. The earlier the better in order to let the magic of compound interest start working in your favor. And as much as possible if you want to have a shot at retiring early (I’m talking at least 20% here, although if you want to check out a really great blog post on the subject, look at this one from Mr. Money Mustache on the shockingly simple math behind early retirement). For us, once we finally got our financial act together and started saving, using free online resource Personal Capital (review here) really helped us to see where our money was going and establish a better budget, as well as better plan our retirement savings strategy. We didn’t find this great free resource until our 30s- wish we’d found it sooner! 3) Know your numbers, including your net worth! I started saving for retirement at age 26, which is young by some standards and old by others. However, because of some of the foolish mistakes that I made in my 20s (mainly by taking on so much student loan debt), it was not until age 32 that my (our) net worth turned positive. If you’ve never calculated your net worth, I encourage you to do it- even if it’s negative, as it was for us when we first calculated it, seeing that negative number can be a MAJOR motivator! Within six months of our first net worth calculation in October 2010, it became a positive number. It wasn’t by accident, either. Knowing that number and knowing that it was negative lit a fire under us that had never been there before. If you have ever thought that it would be great to retire early (before age 65), you are definitely going to want to become familiar with the concept of calculating your net worth, and begin tracking it over time. Keeping an eye on this number in particular will help you know whether you are approximately on track to reach your financial goals, or if maybe you need to make some changes. Retiring before the standard age 65 is definitely a possibility, but it is going to take serious planning. You will absolutely be ahead of the game if you start planning and take steps in the right direction in your 20s! What advice would you give to your 20 year-old self? Were there any big money mistakes you made in your younger years that are still haunting you today? Suggested Reading: One of my favorite personal finance books is The Millionaire Next Door. This book profiles numerous individuals and couples who are masters of frugality and personal finance- and, as the title indicates, are often millionaires. I consider this book to be one of the great must-reads of the personal finance realm, and I absolutely recommend it to anyone who is just starting out on their personal finance journey and trying to find their financial path in life. Sweet point about calculating your net worth… it can be scaaaaary when you are young. Its crappy value could definitely be a motivation. For me, I found it took a real job and savings potential for me to see net worth as a motivator, though. It was more just depressing prior to that, when I didn’t really have a lot I could do to grow it. I definitely understand how it can be depressing when you first calculate it- been there, done that! For me, when we started to calculate net worth was when I began to look at my everyday spending choices in terms of the long view of my life. Prior to that, I had been going through life spending willy nilly, paying little attention to how my day to day choices impacted the bigger picture. When we actually started running the numbers, it kind of woke me up and helped me realize that wasting money on the little things (and bigger things too) was taking me nowhere fast from a financial standpoint. I hindsight I wished I had started doing it years earlier, even though admittedly a minimum wage job would not have had the impact over the long term that higher level jobs have had for us. Student loan debt really is a heavy burden for most people. Even though I’m happy about going to school I did, providing me lots of challenges and ways to develop myself, it was still super expensive. I probably should have forced myself to have taken a bit more time with my classes and taken a job waitressing or something that made a bit more money. I keep hearing that student loan debt is going to be “the next bubble.” I’m interested to see where things go over the course of the next several years, even though sadly I think we can already see to some extent. People taking out huge debt for degrees that may never pay off. Spending years and years paying off student loan debt. I don’t regret going to school, but I sure could have made better choices while living off student loans. I love focusing on the numbers. You might think that your net worth is small (now) but it has so much opportunity to grow! I think many young 20 year olds are thinking about how do I get my own place, hang out with friends, and jump start my career. Putting together spreadsheets of net worths, assets, etc can tell a very different story than just having a budget. Exactly right, Kelly. I think even if you can sort of have the first clue about where you are financially, you are miles ahead of most in the early 20s. Great tips, Dee. I see so many mistakes with student loans, and not the fact they took them, but they took much and funded Spring Break, beer tabs, etc with it. Like you said, all your friends were doing the same so it didn’t raise any flags and for most kids it wouldn’t. They don’t have the life experiences to know better. I definitely agree if you start saving at your first job, you’ll definitely thank yourself later. Time makes a huge difference! We all make money mistakes and the good news is you’ll be able to share your experiences with your daughter to help her avoid repeating them. I sure hope so! I hope to help our daughter avoid some of my own foolish mistakes. I at least got one of those right. My parents had me saving my paychecks from the time I started working. Granted, in college I didn’t put anything away. I wasn’t make a ton of money, and I had day-to-day expenses to cover. But the early lesson made me realize that money wasn’t there just to be spent. Which is something startlingly few young people seem to realize. That’s excellent Abigail. I hope to impart similar financial habits to our daughter as she grows up. So glad to hear that your parents helped you form that habit! I think if I were to give my 20 year old self advice I would tell myself that even though you’re saving as much or more than the “standard” amount doesn’t mean you should spend the rest on whatever you want, just keep saving more and more. I think the idea of wanting to feel “grown up” and buying art instead of posters was something I spent way too much money on. It’s not that I wish I didn’t buy art, but I just wish I didn’t buy as much when I was trying to decorate my house. That’s a great tip, Zee! When I first started a job that paid more than minimum wage- more than I’d ever made before- we kind of used it as an excuse to go a little hog wild with our spending. We didn’t buy anything completely over the top, but we sure ate out a lot in those days. And mostly really crappy fast food, of course. I’m quite certain I could have been spending money in much better ways! Funny – I’m writing a similar post for Thursday! One of my heart’s desires (and I know yours too) is to help young people avoid the financial mistakes we made in our twenties. I’ve learned SO much since then. We can’t go back, but at least we can help others and teach our own children what we’ve learned. I think a big thing we have to realize is that yes, while these “what I would tell me 20 year old self” stuff is nice, I’m not sure most of us would’ve listened to that advice when we were young even if we were told. That’s the thing about being young – we all want to enjoy our glory years. I hear you Tony. Since I can’t go back in time, I’m not sure how well my 20 something self would have taken this advice. But if I can help even a few people make better decisions by blogging about my own dumb mistakes, I’ll consider it worthwhile. My 20-year-old self sucked with money. I never thought more than a few days out, and never really saved a dime. I’m glad I eventually grew up. If I could have back half of the money I wasted in my early 20s, I would be rich! Amen! Same here, for sure. I LOVED to travel and still do. But I’d tell the 20 year old me to invest in starting a business instead off spending every penny on flights and hotels. I enjoyed it but I could have been very wealthy by now because I made a good wage at a steel plant that I could have used to build my own thing. I have that mentality now and it’s working out, but I regret the time I wasted. Yep, I agree. If I hadn’t made all the decisions that I made in the past, I wouldn’t be where I am today. But if I’d made smarter decisions I could definitely be in a better financial place today.